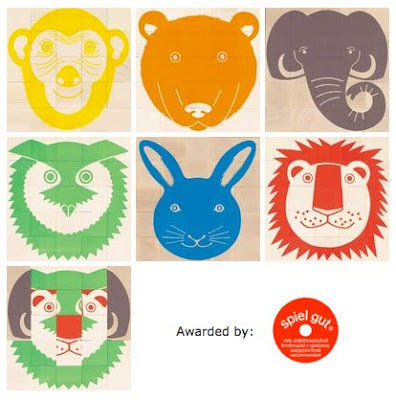 This Swiss take design seriously but Animal Puzzle proofs that this seriousness is not a prerequisite when it comes to designing fun toys with timeless play value. 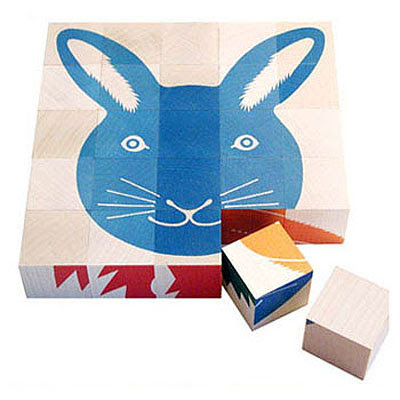 Take for example this wooden toy puzzle which was designed in 1975 by Japanese designer Aoi Huber Kono. Have you ever seen a an elephant with rabbit ears, or a lion with an elephant's trunk? If you can imagine it, you can create it with this Swiss made Animal Puzzle. Naef's Animal Puzzle is one of the most popular wooden puzzles ever made! The Animal Puzzle was designed by Japanese designer Aoi Huber Kono in 1975 and continues to be one of the top selling wooden toys. Play, create and smile with the fantastic Animal Puzzle! Whether an elephant, monkey, lion, owl, hare or bear - all of these animal's faces can be made with the 25 maple wood cubes. Amusing, imaginary animals such as a "lion- owl" or an "elephant-bear" are also waiting to be disovered on safari. Three cards depicting the six basic motifs are enclosed as a guide. A fantastic way to help kids develop imagination while exposing them to good design. Create childhood memories that will last a life time. Naef's Animal Puzzle is a real design classic which is bound to amaze both parents and children with lots of funny smiling faces. It will encourage imagination and creativity for many years to come. The Animal Puzzle is beautifully crafted by Naef in Switzerland with non-toxic colors and environmentally friendly wood. A seriously good toy for young and old(er).